Appalshop is currently seeking two new full-time, salaried positions: an Appalachian Media Institute (AMI) Director and a Roadside Theater Director. 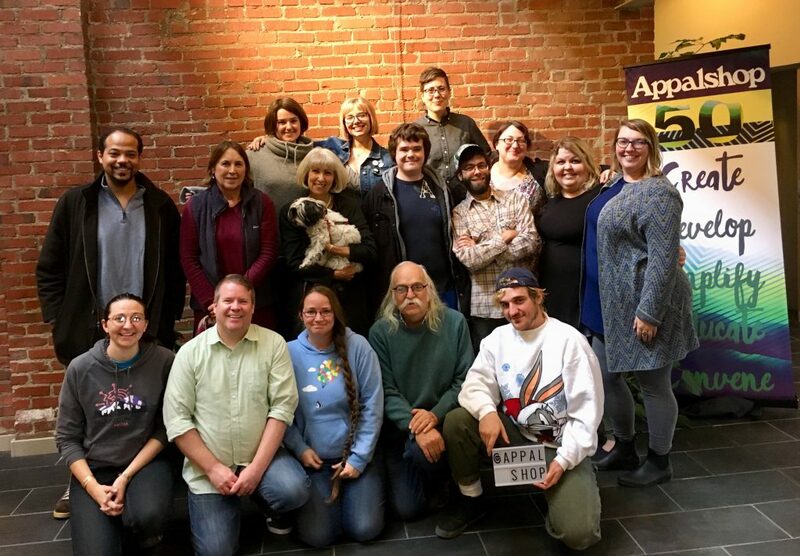 The Appalachian Media Institute (AMI) is a media training program for central Appalachian youth based at non-profit arts and media center Appalshop in Whitesburg, Kentucky. Using the technological and artistic resources of Appalshop, AMI helps young people explore how media production skills can be used to ask, and can begin to answer, critical questions about themselves and their communities. Through the use of media, AMI participants have an opportunity to impact community dialogues and, hopefully, to develop the skills and critical thinking abilities necessary to become leaders in creating sustainable futures for their communities. Since its inception in 1988, AMI has directly engaged over 1,000 young people in media production. The Appalachian Media Institute seeks a Director to lead the program, staff, and financial management of its operations. The AMI Director will serve as lead on development activities, staff supervision, and strategic planning for the future of the program. The AMI Director will often be expected to represent AMI at local, regional, and national events. It is preferred, but not required, that applicants have at least two years of college experience, a Bachelor’s Degree or higher. Preferably, applicants should have at least 2+ years experience in non-profit fundraising, working with youth in media, arts, or other related fields, and/or managing staff. Applicants who are alumni of the program or are from central Appalachia are encouraged to apply. The AMI Director is required to have First Aid training and attend a Sexual Harassment seminar/training. These certifications/trainings if not previously held, must be attained within the first six (6) months of employment. The AMI Director will ensure that all persons working with AMI youth are similarly qualified. The AMI Director will sign a Code of Conduct specific to youth work, and will ensure her/his staff do the same. The AMI Director must also submit to a complete background check. Roadside is the theater wing of nonprofit arts and media center, Appalshop, Inc., in Whitesburg, Kentucky. The Roadside Theater Director will join the theater ensemble to ensure its successful transition as current senior ensemble members continue to move from full-time employment to special project and advisory roles. The Director will have the stability and experience of Roadside’s senior Managing Director full-time for a period of six months or longer, if requested, to help them shape a new ensemble capable of carrying forward Roadside’s 43-year legacy with renewed artistic verve and authority. The Roadside Director will focus on conceptualizing and enacting a program of artistic work that maximizes the vision and creative energies of Roadside ensemble members in furtherance of Appalshop’s mission. Specific responsibilities include ensuring all aspects of play creation and presentation strive for the highest standards of aesthetic and social relevance. Creation aspects include play writing, musical composition, direction, and design. Cultural exchange with other national theater ensembles resulting in the creation of intercultural plays (often bi-lingual) has been one hallmark of Roadside’s creation. Producing standards include enabling participation from audiences that are reflective of an entire community. Roadside’s presentation aesthetic includes seeking venues that enable maximum participation among audience members in the performance event itself. This often includes call and response between audience member and actor, and post-performance story circles in which audience members share their personal stories prompted by the play’s themes and emotions. Other Roadside Director duties include raising money for the theater’s work; participating in Roadside’s signature community cultural development residencies; producing media materials related to the theater’s work; and articulating orally and in writing cultural and artistic policy positions. Institutional responsibilities of the Roadside Director include working with the Managing Director, ensemble members, and Appalshop leadership to plan and implement the theater’s annual program and budget; building synergy between Appalshop divisions as an institutional development priority; representing Appalshop in a variety of regional and national settings; helping monitor staff adherence to Appalshop policies and procedures; co-leading annual personnel evaluation and participating in ensemble members’ hiring and orientation; and assisting with the arbitration of any personnel disputes. The candidate should have at minimum 5 years of experience creating and producing new plays. Roadside/Appalshop seeks an applicant who understands the history of grassroots, populist theater; who has outstanding artistic skills; who can work independently and in teams; and who has the ability to travel. To apply: Please submit a resume; a cover letter explaining in some detail why you are seeking this opportunity; three references from former employers; and, at minimum, seven samples of your artistic work to [email protected].